This stainless steel chain sling is electrically welded for a clean finish, stamped and ideally suited for assembling III- and IV-leg chain slings in welded or assembled systems. The dimensions are similar to DIN 5688‑1. The VWI Master link assembly is tested at 100 % of its load capacity. 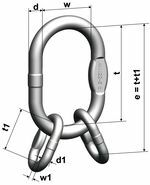 It is made from high-grade stainless steel with a higher resistance to acids and caustics than the standard four-leg chain slings G8, G10 and G12. It is ideally suited for use in water and wastewater applications and can also be used in connection with chemicals and food products; however, restrictions will apply. The stamp and the CE mark ensure that the product is clearly identifiable.